Health Within Chiropractic offers you a fun atmosphere with friendly team members who are ready to welcome you. 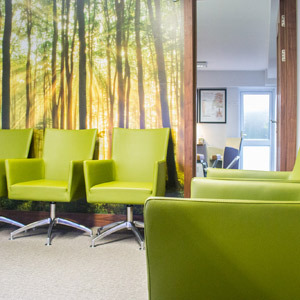 Our patients love visiting our family-orientated office. Kids are welcome and have toys they can play with. It’s an energetic, positive place to be! You’ll be greeted by a member of our team when you step in. They will set you up with intake forms that give us more details about your health. Then you’ll meet Dr Muireadhach, who will spend 45 minutes to an hour with you. You’ll discuss your health history, going back as far as we can. Next, we’ll do orthopaedic tests that look at your body’s muscles and neurological tests, which look at your nerves. This process is essential to getting you a proper diagnosis. You’ll be booked back for a follow-up to go through today’s results. Dr Muireadhach will sit down with you to go through a report of his findings, including your diagnosis and a care plan personalised to you. You’ll usually see us once or twice a week for the first four weeks, then once a week for the next four weeks. The first adjustment is given on this visit. At future appointments, you can plan on being here for 15-20 minutes. You’ll arrive and check in, then be brought into the clinic. Dr. Muireadhach will talk to you about how you’ve felt since your last treatment. You can bring up any new concerns you might have, and we’re happy to answer all your questions. You’ll receive an adjustment and then be allowed to rest afterwards to make sure you’re feeling good. Get a complimentary spine check and postural analysis — it takes just 10 minutes! Contact us today to find out more.